Mick Cooper is an internationally recognised author, trainer and consultant in the field of humanistic, existential and pluralistic therapies. He is a Chartered Psychologist, and Professor of Counselling Psychology at the University of Roehampton. Mick has facilitated workshops and lectures around the world, including Australia, Lithuania and Florida. 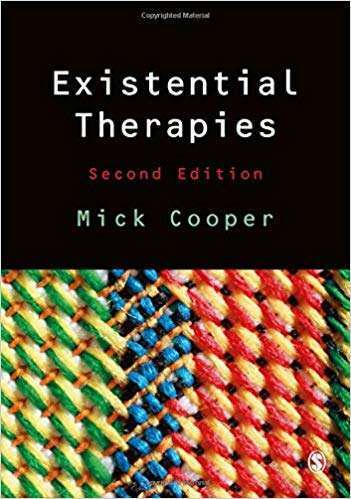 Mick’s books include Existential Therapies (Sage, 2017),Working at Relational Depth in Counselling and Psychotherapy (Sage, 2018), and The Handbook of Person-Centred Psychotherapy and Counselling (Palgrave, 2013). His principal areas of research have been in shared decision-making/personalising therapy, and counselling for young people in schools. In 2014, Mick received the Carmi Harari Mid-Career Award from Division 32 of the American Psychological Association. He is a Fellow of the British Association for Counselling and Psychotherapy and the Academy of Social Sciences. You can follow him on twitter: @mickcooper77. This interview mostly focuses on Mick’s book ‘Existential Therapies‘, which went into its second edition in 2017.